Maybe you’re young and brimming with ambition. Maybe you’re young and struggling. Maybe you’ve already accomplished enough to last a lifetime. Maybe you’re stunned to find out how empty it is at the top. Maybe you’re charged with leading others through a crisis. Maybe you just got fired. Maybe you just hit rock bottom. Wherever you are, whatever you’re doing, your worst enemy already lives inside of you: your ego. 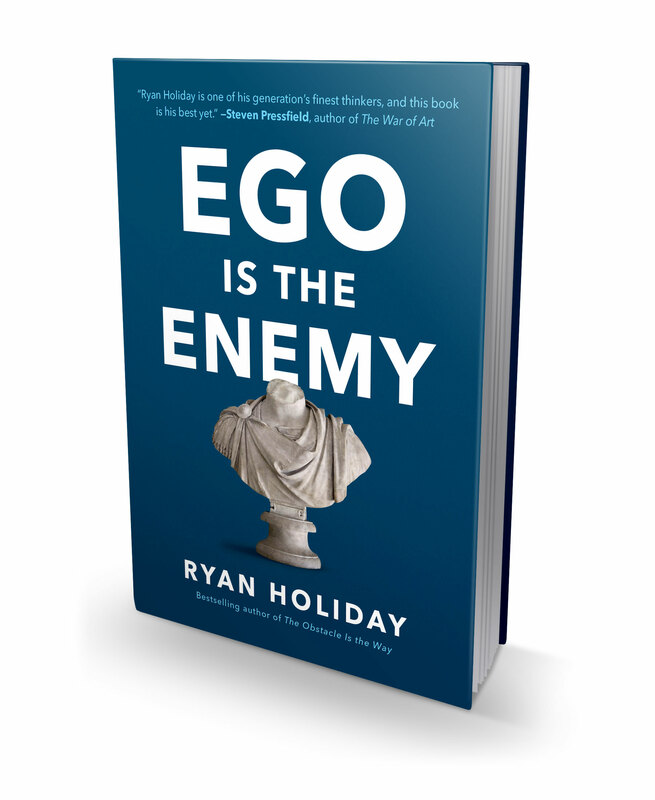 In this excerpt from Ego Is the Enemy, Ryan Holiday, best-selling author of The Obstacle Is the Way, tackles the non-Freudian or casual definition of ego and its dangers: an unhealthy belief in our own importance. Ego is that petulant child inside every person, the one who chooses getting his or her way over anything or anyone else. If ego is the voice that tells us we’re better than we really are, we can say ego inhibits true success by preventing a direct and honest connection to the world around us. Holiday, a wunderkind marketer and strategist, seemed to have the world on a string by age 25. But soon the “influence, platform, press, resources, money… [and] notoriety” clouded the downward spiral going on in so many other areas of his life. He diagnosed himself as a workaholic whose drive might kill him. His fiancée left him because he no longer seemed to be the same person. His faith in himself collapsed. When we remove ego, he writes, we’re left with what’s real: humility, yes—but rock-hard humility and confidence. Months later, after much self-exploration, Holiday realized that the stories he told himself about himself were what took him down. When we remove ego, he writes, we’re left with what’s real: humility, yes—but rock-hard humility and confidence. Whereas ego is artificial, this type of confidence can hold weight. Ego is stolen; confidence is earned. Some learn humility. Some choose ego. Some are prepared for the fluctuations of fate, both positive and negative. Others are not. Which will you choose? Who will you be? In 1879, the preservationist and explorer John Muir took his first trip to Alaska. As he explored the fjords and rocky landscapes of Alaska’s now famous Glacier Bay, a powerful feeling struck him all at once. He’d always been in love with nature, and here in the unique summer climate of the Far North, in this single moment, it was as if the entire world was in sync. As if he could see the entire ecosystem and circle of life before him. His pulse began to pick up, and he and the group were “warmed and quickened into sympathy with everything, taken back into the heart of nature” from which we all came. Thankfully, Muir noticed and recorded in his journal the beautiful cohesion of the world around him, which few have ever matched since. We feel the life and motion about us and the universal beauty: The tides marching back and forth with weariless industry, laving the beautiful shores, and swaying the purple dulse of the broad meadows of the sea where the fishes are fed, the wild streams in rows white with waterfalls, ever in bloom and ever in song, spreading their branches over a thousand mountains; the vast forests feeding on the drenching sunbeams, every cell in a whirl of enjoyment; misty flocks of insects stirring all the air, the wild sheep and goats on the grassy ridges above the woods, bears in the berry tangles, mink and beaver and otter far back on many a river and lake; Indians and adventurers pursuing their lonely ways; birds tending to their young—everywhere, everywhere, beauty and life and glad, rejoicing action. In this moment, he was experiencing what the Stoics would call sympatheia: a connectedness with the cosmos. The French philosopher Pierre Hadot has referred to it as the “oceanic feeling.” A sense of belonging to something larger, of realizing that “human things are an infinitesimal point in the immensity.” It is in these moments that we’re not only free but drawn toward important questions: Who am I? What am I doing? What is my role in this world? Nothing draws us away from those questions like material success, when we are always busy, stressed, put upon, distracted, reported to, relied on, apart from. When we’re wealthy and told we’re important or powerful. Ego tells us meaning comes from activity, that being the center of attention is the only way to matter. When we lack a connection to anything larger or bigger than us, it’s like a piece of our soul is gone—like we’ve detached ourselves from the traditions we hail from, whatever that happens to be (a craft, a sport, a brotherhood or sisterhood, a family). Ego blocks us from the beauty and history in the world. It stands in the way. Walk onto an ancient battlefield or a place of historical significance. Look at the statues, and you can’t help but see how similar the people look, how little has changed since then—since before, and how it will be forever after. Here a great man once stood. Here another brave woman died. Here a cruel rich man lived, in this palatial home…. It’s the sense that others have been here before you. In those moments, we have a sense of the immensity of the world. Ego is impossible, because we realize, if only fleetingly, what Ralph Waldo Emerson meant when he said, “Every man is a quotation from all his ancestors.” They are part of us; we are part of a tradition. Embrace the power of this position and learn from it. It is an exhilarating feeling to grasp this immensity, like the one that Muir felt in Alaska. Yes, we are small. But we are also a piece of this great universe. The astrophysicist Neil deGrasse Tyson has described this duality well: It’s possible to bask in both your relevance and irrelevance to the cosmos. As he says, “When I look up in the universe, I know I’m small, but I’m also big. I’m big because I’m connected to the universe and the universe is connected to me.” We just can’t forget which is bigger and which has been here longer. Why do you think great leaders and thinkers throughout history have “gone out into the wilderness” and come back with inspiration, with a plan, with an experience that puts them on a course to change the world? It’s because in doing so they found perspective, they understood the larger picture in a way that wasn’t possible in the bustle of everyday life. By silencing the noise around them, they could finally listen to the quiet voice they needed to hear. Creativity is a matter of receptiveness and recognition. This cannot happen if you’re convinced the world revolves around you. By removing the ego—even temporarily—we can access what’s left. By widening our perspective, more comes into view. It’s sad how disconnected from the past and the future most of us really are. We forget that woolly mammoths walked the earth while the pyramids were being built. We don’t realize that Cleopatra lived closer to our time than she did to the construction of those famous pyramids that marked her kingdom. When British workers excavated the land in Trafalgar Square to build Nelson’s Column and its famous stone lions, in the ground they found the bones of actual lions, who had roamed that exact spot just a few thousand years before. Someone recently calculated that it takes but a chain of six individuals who shook hands with one another across the centuries to connect Barack Obama to George Washington. There’s a video you can watch on YouTube of a man on a CBS game show, I’ve Got a Secret, in 1956, in an episode that also happened to feature a famous actress named Lucille Ball. His secret? He was in Ford’s Theatre when Abraham Lincoln was assassinated. England’s government only recently paid off debts it incurred as far back as 1720 from events like the South Sea Bubble, the Napoleonic wars, the empire’s abolition of slavery, and the Irish potato famine—meaning that in the 21st century there was still a direct and daily connection to the 18th and 19th centuries. As our power or talents grow, we like to think that makes us special—that we live in blessed, unprecedented times. This is compounded by the fact that so many of the photos we see from even 50 years ago are still in black and white, and we seem to assume that the world was in black and white. Obviously, it wasn’t. Their sky was the same color as ours (in some places brighter than ours), they bled the same way we did, and their cheeks got flushed just as ours do. We are just like them and always will be. “It’s hard to be humble when you’re as great as I am,” Muhammad Ali once said. Yeah, OK. That’s why great people have to work even harder to fight against this headwind. It’s hard to be self-absorbed and convinced of your own greatness inside the solitude and quiet of a sensory deprivation tank. It’s hard to be anything but humble walking alone along a beach late at night with an endless black ocean crashing loudly against the ground next to you. We have to actively seek out this cosmic sympathy. There’s the famous William Blake poem that opens with “To see a World in a Grain of Sand / And a Heaven in a Wild Flower / Hold Infinity in the palm of your hand / And Eternity in an hour.” That’s what we’re after here. That’s the transcendental experience that makes our petty ego impossible. Feel unprotected against the elements or forces or surroundings. Remind yourself how pointless it is to rage and fight and try to one-up those around you. Go and put yourself in touch with the infinite and end your conscious separation from the world. Reconcile yourself a bit better with the realities of life. Realize how much came before you and how only wisps of it remain. Excerpted and adapted from Ego Is the Enemy by Ryan Holiday, published by Portfolio, an imprint of Penguin Publishing Group, a division of Penguin Random House LLC. Copyright © 2016 Ryan Holiday. Ryan Holiday is the best-selling author of Trust Me, I’m Lying; Growth Hacker Marketing; The Obstacle Is the Way; and Ego Is the Enemy. His books have been translated into 17 languages, and his writing has appeared everywhere from the Columbia Journalism Review to Psychology Today and Fast Company. He lives in Austin, Texas.